Murió santamente en ésta ciudad el 12 de mayo de 1902. Protector insigne de la juventud, consagró a la enseñanza toda su vida y todos sus recursos, haciendo del Colegio Catolico de S. Ildefonso, en cuya fundación le acompaño el Ilmo Sr. Dr. Don Crescencio Carrillo y Ancona entonces simple presbítero, un importante centro de instrucción en que se formaron muchos y distinguidos profesores en los varios ramos del saber. En Izamal fundo también el Colegio de Nuestra Señora de Izamal, con la cooperación de prominentes vecinos de aquella ciudad. El año de 1898 su nombre es respetado y querido por toda la sociedad yucateca y sus altas virtudes cristianas le han de haber alcanzado la vida eterna. Dean of the Holy Cathedral, Apostolic Notary Presbyter, Domestic Prelate and Honorable Servant of His Holiness, was born in Mérida on June 5, 1832. 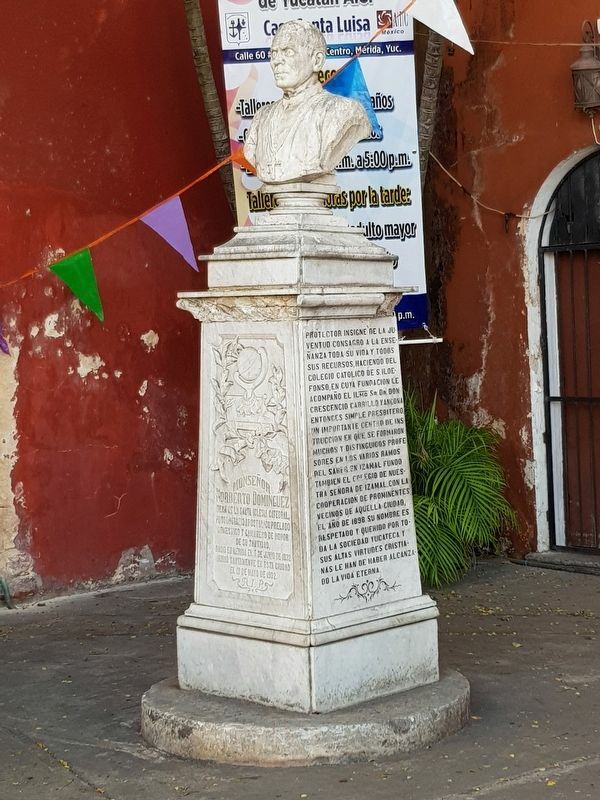 The monument includes a bust of Monsignor Norberto Domínguez. died saintly in this city on May 12, 1902. Outstanding protector of youth, he devoted himself and all his resources to teaching all his life, making the Catholic School of San Ildefonso, in whose foundation he was accompanied by Crescencio Carrillo y Ancona, then a simple presbyter, an important center of instruction in which many distinguished teachers were trained in the various branches of knowledge. In Izamal he also founded the Colegio de Nuestra Señora de Izamal, with the cooperation of prominent residents of that city. 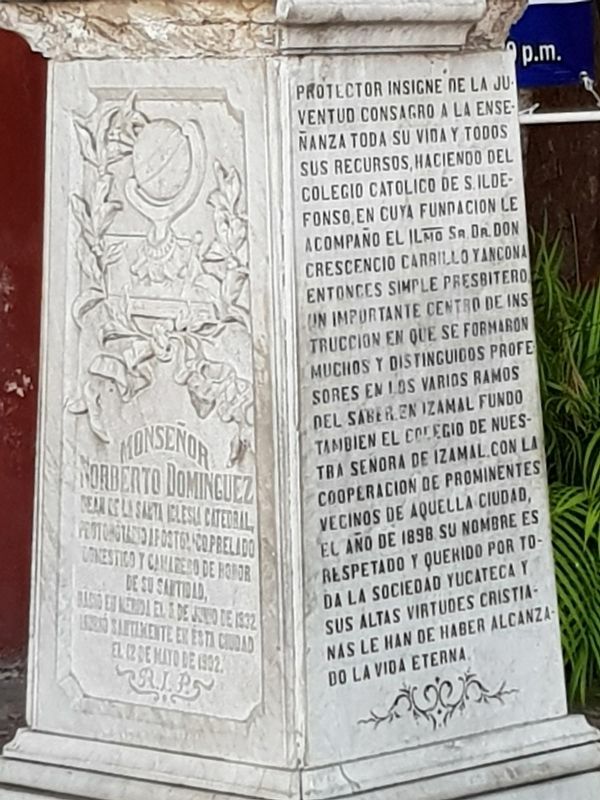 By 1898 his name was respected and loved by the whole Yucatecan society and his high Christian virtues must have allowed him to have reached eternal life. Location. 20° 57.834′ N, 89° 37.589′ W. Marker is in Mérida, Yucatán, in Municipality of Mérida. Marker is on Calle 64 just north of Calle 67, on the right when traveling north. Touch for map. Marker is in this post office area: Mérida, Yucatán 97000, Mexico. Touch for directions. The marker and monument can be seen to the left in this view in the atrium of the Temple of Our Lady of Consolation. 210 meters away); "The Count" (approx. 0.3 kilometers away); Former Mansion of Doña Josefa Escudero Aguirre (approx. 0.3 kilometers away); Fotografía Guerra (approx. 0.3 kilometers away). Touch for a list and map of all markers in Mérida. More about this marker. As the church atrium was locked on the day of this visit (February 18, 2019), it is possible that the monument also includes text on its reverse and proper right side. More. Search the internet for Monsignor Norberto Domínguez. Credits. This page was last revised on March 15, 2019. This page originally submitted on March 15, 2019, by J. Makali Bruton of Querétaro, Mexico. This page has been viewed 31 times since then. 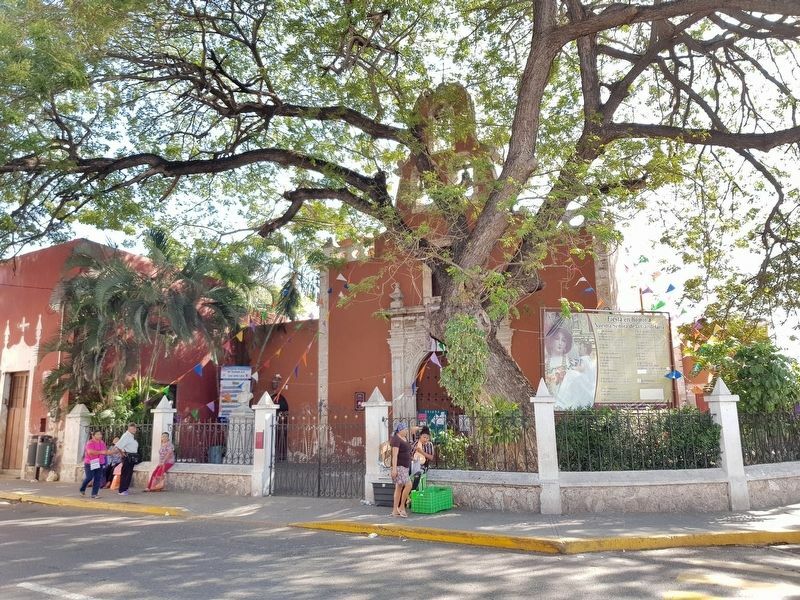 Photos: 1, 2, 3. submitted on March 15, 2019, by J. Makali Bruton of Querétaro, Mexico.